You remember the double-popped collar of the 80s? Yeah, well...I'm bringin' that back. And the cool weather that we have been having recently was happy to oblige. What wasn't you ask? Well that would be the sun - which due to the fact that it now sets before 5 pm left me to take these pictures inside. Honestly though, what's not to love about chambray, plaid, and a top knot? Not much in my opinion. Love the chambray with the plaid, adorable! Your outfit is fabulous! It's all about the plaid this year!!! cute denim with plaid mix! So cute and preppy! Love that plaid print!! Love this layering. You CANNOT go wrong with plaid and chambray! 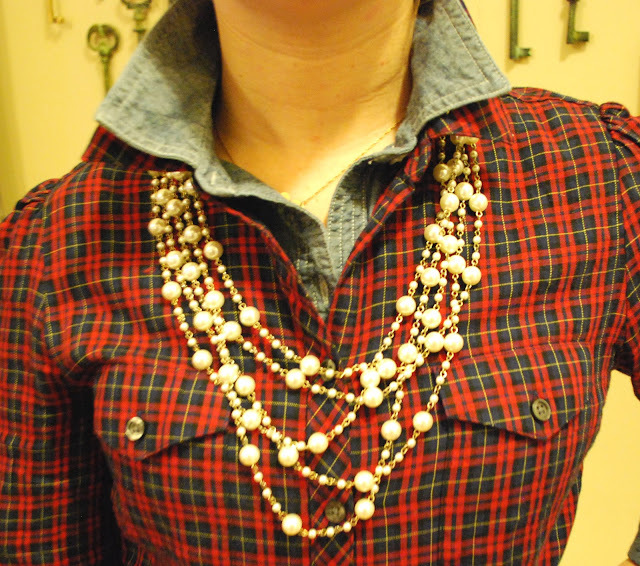 I love the layering of the jean and plaid! awesome combo! I absolutely love the double popped collar...I think it's classic as is the plaid and chambray! So cute and very festive. I read through your blog and that quote from the founder of net-a-porter is great and so true. I will always keep that one in mind! I am loving the layering paired with the classy jewels. Such a classic combination. I've been on the hunt for a great statement piece for quite awhile now. Super adorable!!!!! I absolutely LOVE this!!!!!! i'm totally copying this look for work! LOVE that double collar! Really enjoying following your blog and reading back through all your posts!